We have talked long and hard about the iPhone X and its brutal ascendancy in the sector in the coming years , both in own devices and those of the competition. In fact, we know that next year will be presented 3 iPhone models and all of them will have a screen almost without borders, without Home button and with that characteristic notch . With these signs, the future of the iPhone SE painted very black. Or not, judging by a brutal render that has just arrived. With this iPhone SE 2 it would be very difficult to resist . Let's be honest: how good it feels to the little one in the family , who would still have an aluminum case, the design inspired by the iPhone X. What beauty is that infinite screen, that discreet notch and all this in a terminal that fits in any pocket . The original iPhone SE was launched in March 2016, achieving a gap between the hearts of users who were looking for ergonomics and the reliability of the iOS environment without leaving the salary in the attempt. And is that in a market whose trend is the phablet, there are still users who like small and manageable . 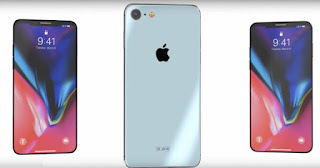 In this impressive concept, it would squeeze the characteristics of the iPhone X in a 4-inch terminal , which obviously would not have the vertical dual camera and as we say, it seems that it would retain the aluminum. However, it would not be unreasonable to jump into a crystal case, achieving a device that would remember the mythical iPhone 4 quite. Without a doubt, this iPhone SE 2018 would get a good reception in the market by combining the best of the iPhone X with the versatility of the SE . Unfortunately this is a concept, but hopefully take note of this beautiful concept in Cupertino . What do you think of the concept of iPhone SE 2? Would you buy it?